Don't bother downloading a pre-made shooter. Just make one yourself. Standing out in a crowded genre is far from easy, especially if you intend to create a shooter. You need a hook, something we haven't seen before. That's what makes Sketch Nation Shooter so memorable. This imaginative game features an editor that allows you to build your own blast fest from the ground up, complete with obstacles, enemies and bosses. Then you can save your creations and share them with friends. Although the technology doesn't always work properly, it's good enough that you'll waste a few hours drawing spaceships, aliens and whatever else you can dream up. Here's how it works. The Game Creation Wizard allows you to import drawings using the iPhone camera. First, you'll come up with a title for the game. Next, you'll create a hero. To do this, simply draw the protagonist on a sheet of paper (white or off white preferred) and snap the photo. From there, the editor will upload the image and put it in game; the same holds true for enemies. 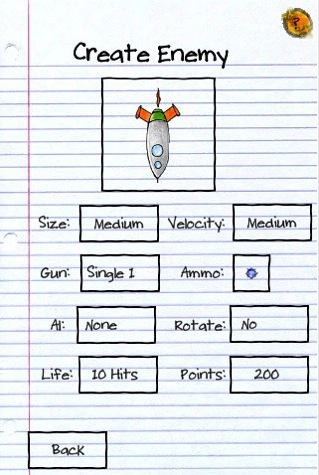 Then you can test your game, maneuvering whatever you designed past obstacles and destroying bad guys with auto fire. That basic mode will allow you to have a shooter up and running in minutes. If you crave something more advanced, though, there's a more in-depth option that adds several features to the mix. In addition to creating your own levels (up to four, using the camera), you can also make bosses and several different types of enemies. You can even adjust their size, choose their weapons, number of hits to destroy, number of points earned after destroying them and attack patterns (hover, kamikaze). Since we're naughty, the first thing we drew was a dude's wiener. Sure enough, the game recognized our crude sketch and incorporated it into the game. A short while later, we were guiding that phallic symbol through an asteroid field, shooting butts on our way to victory. As expected, the limited technology hampers the fun. Although you can choose images from the iPhone's photo library, the game has trouble with pictures taken in medium light. That, sadly, prevented us from making our girlfriends end level bosses. On the positive side, the developers included four pre-made games as an example of what you could do; they even sport different colored graphics. 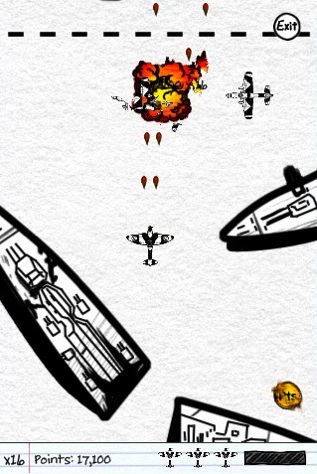 Air Support 1944 plays like Capcom's 1943 series, as you guide a plane past warships and take down incoming fighters. Traffic!, meanwhile, challenges you to dodge vehicles while collecting points. Under the Sea casts you as a seahorse out for blood against crabs and blowfish, while Zorx Attacks: Episode 1 operates exactly like Air Support, except you're in space dodging asteroids and rival ships. The best feature, though, is the option to connect with other gamers online and download their shooters. That adds limitless value to an already great product. For .99, Sketch Nation Shooter comes highly recommended. It lacks the competition's bells and whistles, but the ability to incorporate your own designs makes it a guilty pleasure no one should pass up. Just be careful what types of drawings you share with other gamers. Not everyone appreciates nudes. What's Hot: Four pre-made shooters, useful editor lets you create your own games, excellent use of the iPhone camera, decent number of options to tinker with, you can download other people's games, only .99. What's Not: Game has trouble uploading photos of people and places, you cannot use your own music.